For the sugar-based confectionery, see Marshmallow. For other uses, see Marshmallow (disambiguation). Marshmello's second song in 2016, a platinum-certified single titled "Alone" was released in May via the Canadian record label Monstercat. Having peaked on the US Billboard Hot 100 at number 60, it became his first single to be certified platinum in the US and Canada with over a million copies of certified units. [lower-alpha 1] That year, he released three subsequent singles. In 2017, after releasing singles such as "Chasing Colors", "Twinbow" and "Moving On", Marshmello collaborated with R&B singer Khalid to release "Silence" as a single, which was certified platinum and multi-platinum in eight countries. Succeeding another single, one of his best-selling singles, a collaboration with Selena Gomez was released, titled "Wolves". His second single of 2018, titled "Friends", was released as a collaboration with singer Anne-Marie. Months later, his second studio album, Joytime II, was released with singles "Tell Me" and "Check This Out". Achieving similar charting success like the debut album with positions on three Billboard charts, Joytime II, failed to appear on charts outside the United States and was reviewed as below average by publications such as Rolling Stone and Pitchfork. Marshmello's highest-charted song on the Billboard Hot 100 and in the United Kingdom was released in August titled "Happier". He was named by Forbes in eighth place in their annual ranking of the world's highest-paid DJs in 2017 as he earned $21 million in the twelve months before June 2017. Marshmello posted his first original song "Wavez" to his SoundCloud page in the early months of 2015. [lower-alpha 2] As he released more songs, he began to receive support from musicians such as Skrillex, who reposted his song "Find Me" on SoundCloud. Shortly after, he made performances at New York's Pier 94, Pomona, California's HARD Day of the Dead festival, and Miami Music Week. He is managed by Moe Shalizi of Red Light Management. Having had an image of masking himself with a white bucket, Marshmello was frequently suggested to be Chris Comstock, an American DJ who was better known as Dotcom at the time, because their musical styles are similar. 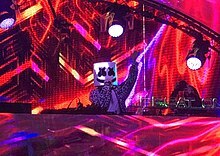 Marshmello performed at Electric Daisy Carnival 2016 in Las Vegas on June 19. 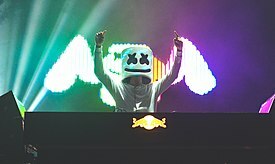 In a gimmick attempted by Marshmello and Dutch DJ Tiësto, the latter who wore the same clothes as the former on stage, took off his helmet presenting himself as Marshmello. It was later disregarded as a publicity stunt by fans and the media due to their conflicting tour dates and a photo of "the two helmeted DJs hanging out together pre-show". He announced the Ritual Tour on Twitter, in which he performed in several countries including the United States, China, South Korea, India and Paraguay from late September until early January of the following year. [lower-alpha 5] The tour was accompanied with his debut on dubstep musician Skrillex's Owsla label, with a single titled "Ritual", in which vocalist Wrabel was featured. An official music video for the song was published to YouTube. [lower-alpha 4] Soon after, Marshmello launched his own record label named Joytime Collective and recruited fellow DJ and producer Slushii as the first signee on its roster. Marshmello collaborated with Ookay to release the single "Chasing Colors" featuring vocals by Noah Cyrus. He later collaborated with Slushii to release the single "Twinbow", a song previously only known to the public as a snippet. During the mid-year, his third single of the year titled "Moving On" was released, having debuted two years before receiving the official release. A music video for the song was also published, having received 169 million views as of December 2018. [lower-alpha 4] Months later, Marshmello announced upcoming collaborations with American hip hop recording artist Blackbear and Demi Lovato. The collaborations, however, were never released officially as of December 2018. Following that, Marshmello released "Love U" as a single for free as appreciation to his fans. The song was described by Billboard as a "gritty dance-pop single with a pounding bass line and helium-breathed vocals." In November, Forbes published an article confirming Christopher Comstock as the individual behind the Marshmello project, with regards to existing proofs such as his real name being revealed in music royalty manager BMI's database and that Marshmello's company was registered in August 2015 under Comstock in Delaware. Furthermore, it was also disclosed to Forbes by industry insiders that the two are the same person. Previously-known evidences such as the ASCAP credit, their physical and musical similarities, and Skrillex addressing Marshmello as "Chris" were taken into account of confirming Marshmello's identity. Among the other singles released after the work with Anne-Marie were a song with rapper Logic titled "Everyday", which was released as the third single from his seventh mixtape, Bobby Tarantino II, "Fly" and "You Can Cry", a collaborative single with rapper Juicy J and British soul singer James Arthur. On June 19, Marshmello announced on Twitter his second studio album titled Joytime II, which would be musically similar to its predecessor. The album was released on June 22, 2018. Rolling Stone described it as monotonous and Marshmello's decision to not feature guests as disappointing, stating "every song sounds like it has already been pre-leased for use by energy-drink companies or extreme-sports squads." The album was given a 'one-and-a-half star' rating by the magazine, while Pitchfork gave the album a 4.2 out of 10 rating. Two singles were released off the album in June, titled "Tell Me" and "Check This Out",[lower-alpha 3] the latter of which receiving an official music video published several months later. In August 2018, he collaborated with British band Bastille to release a single titled "Happier" in August. [lower-alpha 3] It became his highest charting song in Canada, Sweden, the United Kingdom and the United States while becoming his third number one song on the Dance/Electronic Songs chart. The song was certified gold in Belgium, Sweden and the United Kingdom, platinum in New Zealand and the United States, and double-platinum in Australia and Canada. [lower-alpha 1] His subsequent singles, collaborations with Egyptian singer-songwriter Amr Diab titled "Bayen Habeit" and American rapper and producer Roddy Ricch titled "Project Dreams", were released in December. Marshmello announced that month, he was working on his upcoming third studio album, Joytime III. In January 2019, Marshmello collaborated with the free-to-play video game Fortnite Battle Royale to throw an in-game concert, along with releasing merchandise based on the game. On February 2nd and 3rd, the concert was held, and the first amassing over 10 million players. Deadmau5 inspired Marshmello's appearance and style. Marshmello wears a custom helmet for public appearances. His identity was not known initially, but was confirmed to be Chris Comstock in late 2017 by Forbes, citing events such as Skrillex's referring of Marshmello as "Chris" in an interview, the managerial connection of Shalizi, and the similar tattoos and birthday. His stage name, an alternative spelling of "marshmallow", and his marshmallow mascot head were both inspired by Canadian electronic music producer Deadmau5, who also notably uses an alternate spelling for his stage name and performs wearing a "dead mouse" mascot head. Acknowledgement of Deadmau5's contribution to Marshmello's persona is evident in the music video for "Alone". Marshmello also referenced Deadmau5 with a variant of his helmet (with a third ear) featured in the original edit of "Ritual"s music video. It was removed at Deadmau5's demand. His musical style includes groove-oriented, synth and bass-heavy electronic dance music. Inspired by other masked DJs like Deadmau5 and Daft Punk, Marshmello appears wearing a full-head-covering white-colored bucket. Despite the anonymity, his career received international recognition in 2015 when he began releasing tracks online, including remixes of Zedd's "Beautiful Now", Jack Ü's "Where Are Ü Now" and others, as well as his own single "Alone". As a YouTuber, Marshmello has published gaming and cooking videos for his series "Gaming with Marshmello" and "Cooking with Marshmello". In an episode of the latter, American singer Paula Abdul was featured as a guest. In the cooking series, Marshmello was shown presenting his methods of cooking, for foods such as meals, snacks and desserts. Appearing as non-speaker, he used body language to express himself in the videos. Marshmello, together with Fortnite player Tyler "Ninja" Blevins, have won prize money of a million dollars from Epic's E3 Celebrity Pro Am charity tournament. Half of the million was donated to KIND (Kids in Need of Defense), an organization providing legal counsel to refugees and immigrant children. With the single "Happier" and its pet-dog-themed video, he supported the #FindYourFido campaign by American Society for the Prevention of Cruelty to Animals (ASPCA) in October 2018, also recognized as "Adopt a Shelter Dog" month. Marshmello has been awarded Best Electronic at the 2018 MTV Europe Music Awards, his first major award win. Having previously received nominations such as Best Dance Track at the Radio Disney Music Awards, Top Dance/Electronic Artist at the Billboard Music Awards, and multiple at the Teen Choice Awards in 2018, Marshmello was given them most notably for works such as "Alone", "Wolves", "Silence" and "Friends". 1 2 3 4 5 6 7 8 9 10 Adapted from Marshmello discography. 1 2 3 4 Adapted from Marshmello on iTunes. 1 2 3 4 Adapted from Marshmello's channel on YouTube. ↑ @Marshmellomusic (August 19, 2016). "Proud to announce the Ritual Tour! More dates are being added" (Tweet) – via Twitter. 1 2 Collar, Matt. "Marshmello – Biography & History". AllMusic. Retrieved December 14, 2018. ↑ GQ (September 20, 2018). Marshmello Goes Undercover on Twitter, YouTube, and Reddit | GQ. YouTube. ↑ Bein, Kat (June 26, 2018). "Marshmello Launches Gaming Digital Series With Ninja". Billboard. Retrieved December 14, 2018. ↑ Zack O'Malley Greenburg (August 8, 2017). "The World's Highest-Paid DJs 2017". Forbes. Retrieved February 4, 2019. ↑ Robehmed, Natalie (August 8, 2017). "Inside Masked Newcomer Marshmello's $21 Million Year". Forbes. Retrieved December 14, 2018. ↑ "Who is Marshmello? An in-depth look at electronic music's newest mystery". Dancing Astronaut. June 26, 2015. Retrieved December 14, 2018. ↑ Stutz, Colin (November 19, 2018). "Marshmello's Manager Moe Shalizi Is Leaving Red Light to Start His Own Firm: Exclusive". Billboard. Retrieved December 14, 2018. 1 2 Sachs, Elliot (May 21, 2016). "Skrillex Confirms Rumor of Marshmello's Identity With New Instagram Post". Your EDM. Retrieved December 14, 2018. ↑ Peters, Mitchell (January 9, 2016). "Marshmello Self-Releases First Album 'Joytime'". Billboard. Retrieved December 14, 2018. ↑ Meadow, Matthew (June 20, 2016). "Marshmello Trolls Everyone at EDC Las Vegas By Revealing His 'True Identity' [VIDEO]". Your EDM. Retrieved December 14, 2018. ↑ "Watch Tiësto Trick EDC Las Vegas Attendees into Thinking He's Marshmello". Billboard. Retrieved August 13, 2016. ↑ Staff, Your EDM (July 22, 2016). "Marshmello Posts Helmet-Less Picture on Instagram & Deletes It Immediately [SCREENSHOT]". Your EDM. Retrieved August 13, 2016. ↑ "Tiësto trolls EDC into believing he's Marshmello – Dancing Astronaut". Dancing Astronaut. June 20, 2016. Retrieved August 13, 2016. ↑ Lyndsey, Havens (August 19, 2016). "Marshmello Announces Worldwide Dates for the Ritual Tour". Billboard. Retrieved December 14, 2018. ↑ McCarthy, Will (October 26, 2016). "Marshmello announces release date of his new OWSLA single, 'Ritual'". Dancing Astronaut. Retrieved December 14, 2018. ↑ Verdugo, Kristina (February 8, 2017). "Slushii Releases "Dear Me" as Free Download". The Nocturnal Times. Retrieved December 14, 2018. ↑ Bein, Kat (February 24, 2017). "Marshmello, Ookay & Noah Cyrus Are Living High on 'Chasing Colors': Listen". Billboard. Retrieved December 14, 2018. ↑ Meadow, Matthew (March 17, 2017). "Slushii & Marshmello's Collab Is Finally Here, But Does It Live Up to the Hype? [LISTEN]". Your EDM. Retrieved December 14, 2018. ↑ Bein, Kat (May 5, 2017). "Marshmello Graduates to Bigger, Better Things in 'Moving On' Video: Watch". Billboard. Retrieved December 14, 2018. ↑ Powell, Karlie (May 4, 2017). "Marshmello Drops Pre-Recorded Set in Music Video For His Next Single [WATCH]". Your EDM. Retrieved December 14, 2018. ↑ Yau, Jeffrey (July 8, 2017). "Marshmello Just Revealed His Next Single With This Rising Hip Hop Phenom [Details]". Your EDM. Retrieved December 14, 2018. ↑ "Demi Lovato teams up with Marshmello for song 'Love Don't Let Me Go'". Times of India. Retrieved December 14, 2018. ↑ Rishty, David (July 28, 2017). "Marshmello Shows His Love for Fans With Free Song 'Love U': Listen". Billboard. Retrieved December 14, 2018. ↑ "Hear Marshmello, Khalid Unite on Stirring New Song 'Silence'". Rolling Stone. August 11, 2017. Retrieved December 14, 2018. ↑ Grant, Sarah (October 25, 2017). "Hear Selena Gomez's Propulsive New EDM Song, 'Wolves'". Rolling Stone. Retrieved December 14, 2018. ↑ Bein, Kat (October 20, 2017). "Marshmello Drops 'Silence' Video With Khalid, Sings On Pop-Punk Song 'You & Me'". Billboard. Retrieved December 27, 2018. ↑ Rishty, David (November 10, 2017). "Marshmello Goes to the Carnival in Animated 'You & Me' Video". Billboard. Retrieved December 14, 2018. 1 2 Robehmed, Natalie (November 14, 2017). "Unmasking Marshmello: The Real Identity Of The $21 Million DJ". Forbes. Retrieved December 14, 2018. ↑ Bein, Kat (January 10, 2018). "Marshmello Reveals Lil Peep Collaboration Title and Artwork". Billboard. Retrieved December 14, 2018. ↑ Bein, Kat (February 2, 2018). "Marshmello Goes From DJ to Lead Singer on Slushii's 'There x2': Listen". Billboard. Retrieved December 14, 2018. ↑ Zidel, Alex (February 28, 2018). "Logic Announces Marshmello Collaboration "Everyday"". HotNewHipHop. Retrieved December 14, 2018. 1 2 Bein, Kat (June 5, 2018). "Marshmello Teases New Single From 'Joytime II'". Billboard. Retrieved December 14, 2018. ↑ Bein, Kat (May 16, 2018). "Marshmello Confirms 'Joytime Part 2' Album". Billboard. Retrieved December 14, 2018. ↑ Leight, Elias (June 22, 2018). "Review: Marshmello Can't Escape Monotony on 'Joytime II'". Rolling Stone. Retrieved December 14, 2018. ↑ Fitzmaurice, Larry (June 29, 2018). "Marshmello: Joytime II". Pitchfork. Retrieved December 27, 2018. ↑ Bein, Kat (October 17, 2018). "Marshmello Reminds Us to Put the Phones Down in 'Check This Out' Video: Watch". Billboard. Retrieved December 14, 2018. ↑ Bein, Kat (September 28, 2018). "Marshmello and Amr Diab Debut World-Melding Song 'Bayen Habeit/In Love'". Billboard. Retrieved December 14, 2018. ↑ Narozniak, Rachel (December 10, 2018). "Marshmello is at work on a 'Joytime III' album". Dancing Astronaut. Retrieved December 19, 2018. ↑ Tassi, Paul. "'Fortnite' Leaks Confirm A Live, In-Game Marshmello Concert This Weekend". Forbes. Retrieved 2019-01-31. ↑ Cameron, John. "Marshmello to Deliver In-Game Set in Fortnite Battle Royale". EDM.com - The Latest Electronic Dance Music News, Reviews & Artists. Retrieved 2019-01-31. ↑ Matos, Michaelangelo (November 29, 2016). "A Brief History of Masked DJs—From Orbital to Marshmello". Vice. Retrieved December 14, 2018. ↑ Kusnierek, Timmy (July 2, 2016). "Marshmello Takes A Shot at Deadmau5, Gets Bullied in New Music Video". Your EDM. Retrieved December 14, 2018. ↑ Bein, Kat (November 1, 2016). "Marshmello Plays With Skrillex, Slushii & Fake deadmau5 in 'Ritual' Video: Watch". Billboard. Retrieved December 14, 2018. ↑ Meadow, Matthew (November 4, 2016). "Marshmello's "Ritual" Video Re-Uploaded Without Deadmau5 Cameo". Your EDM. Retrieved December 14, 2018. ↑ Matos, Michaelangelo (December 27, 2016). "Marshmello Is EDM's Masked Hero". Spin. Retrieved December 14, 2018. ↑ Oh, Lindsey (July 26, 2018). "Marshmello makes açaí bowls with Paula Abdul in newest 'Cooking With Marshmello' episode". Dancing Astronaut. Retrieved December 27, 2018. ↑ White, Abbey (February 5, 2018). "Electronic Music DJ Marshmello Has His Own Cooking Show on YouTube". Food & Wine. Retrieved December 27, 2018. ↑ Tassi, Paul (June 12, 2018). "'Fortnite' Superstar Ninja Wins Epic's First E3 Celebrity Pro Am, And $1 Million For Charity". Forbes. Retrieved December 14, 2018. ↑ Bein, Kat (October 3, 2018). "Marshmello Donates $500,000 to KIND Foundation to Support Refugee and Immigrant Children". Billboard. Retrieved December 14, 2018. ↑ Kreps, Daniel; Kreps, Daniel (September 25, 2018). "Marshmello Shows Bond Between Woman and Pet Dog in Tear-Jerking 'Happier' Video". Rolling Stone. Retrieved December 14, 2018. ↑ "WDM Radio Awards 2017". Los 40 (in Spanish). Archived from the original on March 7, 2017. Retrieved March 17, 2017. ↑ "Radio Disney Music Awards 2017 Winners: The Complete List". E! News. Retrieved December 17, 2018. ↑ "Remix Awards: Top Music Makers Honored in Miami". DJ Times. March 29, 2017. Retrieved December 14, 2018. ↑ "MTV Announces Nominees For 2017 'MTV Woodies' With Voting Exclusively on Snapchat | MTV Press". MTV. March 6, 2017. Retrieved December 14, 2018. ↑ Rishty, David (August 8, 2017). "The Chainsmokers, Justice, Eric Prydz & More Nominated for 2017 Electronic Music Awards". Billboard. Retrieved December 14, 2018. ↑ "DJ of the Year – Bonobo, Rufus du Sol, Eric Prydz & More Win 2017 Electronic Music Awards". The Hollywood Reporter. September 21, 2017. Retrieved December 14, 2018. ↑ "Billboard Dance 100 Artists of 2018: The Complete List". Billboard. March 22, 2018. Retrieved December 14, 2018. ↑ "Shawn Mendes & Meghan Trainor Lead Radio Disney Music Awards 2018 Nominations". Billboard. Retrieved December 14, 2018. ↑ Weatherby, Taylor (June 13, 2018). "Taylor Swift, Drake, Cardi B & More Among Teen Choice Awards 2018 Nominees: See the Full List". Billboard. Retrieved December 14, 2018. ↑ Kaufman, Gil (October 4, 2018). "Camila Cabello, Ariana Grande, Post Malone Lead 2018 MTV EMA Nominees". Billboard. Retrieved December 14, 2018.